Established in April, 2005, Rosse Posse Acres Elk Farm is a licensed and insured elk farm operating in beautiful Molalla, Oregon. We provide quality, farm-raised wapiti (elk meat) for sale along with ancillary elk related products in our gift shop. We sell wapiti by the half or whole elk. Our elk are fed the best quality hay. The meat is very mild in flavor, naturally low in cholesterol and fat, and very lean. If you've never tried wapiti before, you are definitely missing out on one of the best cuts of meat you will ever taste. December - March: There isn't a whole lot going on at the farm during the winter. Winters in the Willamette valley tend to be temperate, but very wet. During the winter, the calves have been weaned from their mothers, and everybody is getting full rations of Alfalfa hay and supplements to carry them through so they are all set for the spring. Check out "Big Boy" after shedding one of his antlers. Picture taken March, 2007. March - April: This is the time when the bulls begin growing their "velvet". Elk Velvet Antler is one of the fastest growing animal parts known to man. It can grow at a rate of an inch or more every day! The velvet begins growing in March and reaches full growth by early August at which time it begins to calcify into hard antler. This is also the time when the bulls are their most docile, which means a great time to give the entire herd their yearly inoculations and parasite control. This is done in the handling facility by running the herd, one by one, through the squeeze chute. The chute has an electronic scale so we know exactly how much each animal weighs; thus we can administer accurate dosages for optimal effect. After the animal is weighed, we put a squeeze on them and then give them their shots. May - June: Calving! What a fun time to be an elk farmer! The calves start dropping towards the end of May and keep coming through the entire month of June. Sometimes we even get a few late ones in July. When the calves are born, the cow/calf pair are not bothered for the first 24 hours of life so that the mother can clean up the calf and bond and the calf can get that vital first nursing accomplished. 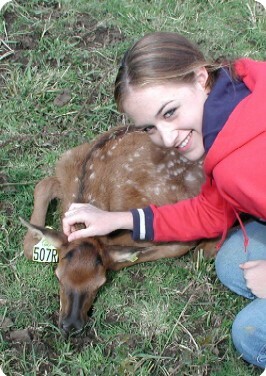 But, the calf does need to be weighed, sexed, tagged, and given a dose of Selenium. So the day after birth finds us out in the field searching for the well hidden little beauties. It is amazing just how well these little guys can hide! Once found, they remain absolutely motionless as we go about our duties. Of course, momma cow is not happy at all with us messing with her precious, which is why before we go out looking for the calf we dupe momma into coming up front for some hay or oats while we slip in behind her and close the gate to the pasture! Pop Quiz: How can you tell the difference between a male and female elk? Answer: Males are tagged in the left ear and females are tagged in the right ear. Extra Credit Question: Why are females tagged in the right ear? Answer: Because girls are always right! August - September: Hard Antler! The bulls begin forming hard antler as their velvet reaches full growth in early August and the antler begins to calcify. The calcification process begins at the base of the antler, or the pedicle, and proceeds up the entire length of the antler. As the antler reaches full calcification, the bull begins to find something to rub the velvet "skin" off of the now hard antler. Trees are the perennial favorite for the bulls to rub on, but anything will do: fence posts, fencing, barns, tractors, etc. As the Summer fades slowly into Fall and the nights begin to get that chill in the air, the bulls begin to show more and more aggression as they approach the "rut" period. It is at this point that we collect the bulls into the handling facility and remove the hard antler. A bull in hard antler can be a dangerous animal, especially when he is all steamed up in rut. Not only is the antlered bull dangerous to both the rancher and the other elk, but he is also very destructive to fences, gates, and barns. Therefore, we've decided that, although there is nothing quite as majestic to look at than a full grown Rocky Mountain bull Elk in hard antler, it is just not worth the damage and danger to keep them in hard antler. So, if you want to see bulls in hard antler, I suggest you come before the last week of August. September - November: Rut! It's "hands off" time at the ranch during rut. The bulls are at their most aggressive; bugling and posturing in the attempt to establish dominance and thus, in their minds, have the opportunity to mate with the cows. It doesn't seem to cross their minds that the people have already selected which bull will mate with which cows. They still think by filling the air with their eerie, yet intoxicatingly savage calls they will somehow influence our decision on just who really should be doing the breeding. About the most we do with the animals during rut is toss them some alfalfa over the fence to keep them happy. Sounds dull, but I have to tell you that there is NOTHING quite like walking down a 16' lane with two 800+ pound bulls on either side of you bugling and glunking and chuckling as you toss the hay to them. What an exhilarating experience!